Referring to them as "birds of courage," Benjamin Franklin believed the turkey should be named the national bird as of the United States (instead of the bald eagle). Perhaps he admired the intelligence, beauty or resourcefulness of turkeys - these are characteristics unknown to most Americans who, today, often view turkeys as little more than the center of the holiday dinner table. Yet anyone who has the opportunity to meet these animals at sanctuaries will tell you that they are highly intelligent animals who, just like the dogs and cats in our homes, are playful individuals with unique personalities. They also form strong social bonds and show affection towards one another. Mothers raise their chicks for five months and fiercely protect them from danger. 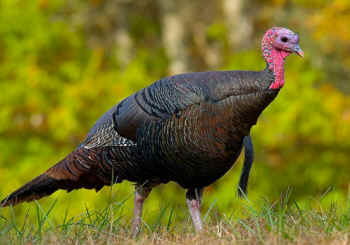 Their intelligence is also evident in the fact that turkeys can recognize each other by their voices, and more than 20 unique vocalizations have been identified in wild turkeys. 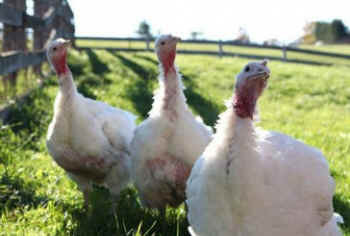 Turkeys living in the wild or on sanctuaries enjoy building nests, foraging, taking dust baths and raising young. They are incredibly curious and inquisitive animals who enjoy exploring, and their ability to remember the geographic content of an area larger than 1,000 acres aides this curiosity.